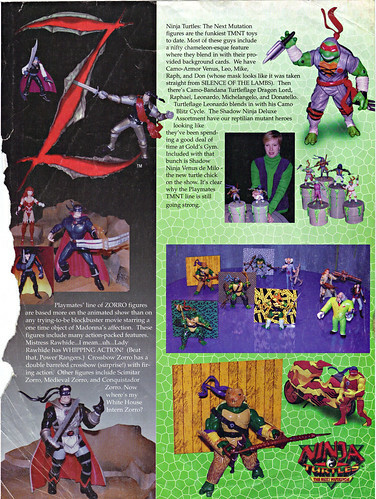 –>> .. included on this random page are Varner Studio’s ZORRO and NEXT MUTATION offerings for 1998. I don’t believe this proposed second ZORRO wave was ever produced. The infamous wave that included fan-fave LADY RAWHIDE. 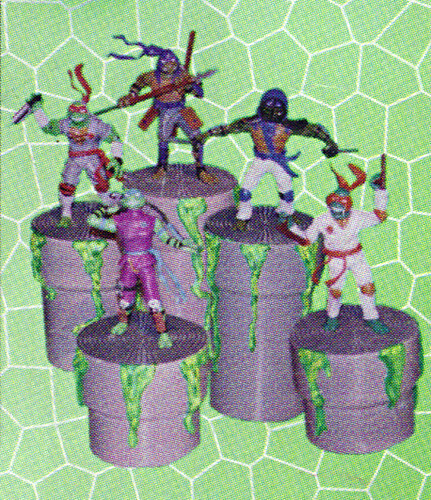 You may or may not recall : The NEXT MUTATION “Turtleflage” assortment would make to retail for the most part. 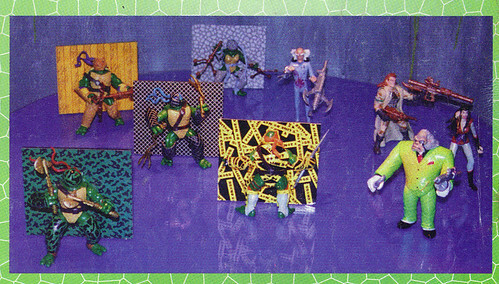 The basic Turtleflage teens made it to store pegs, tho i never saw the basic CAMO TMNTs myself locally. However, 3 of the four main villains from that wave ( Simon Bonesteel, the Eastman designed Silver the Gorilla, and Vam Mi ) were readily available with the Wave 1 assortment at a local Walmart, i snagged them quickly and the three are now the hi-lights of my collection of figures and dust. 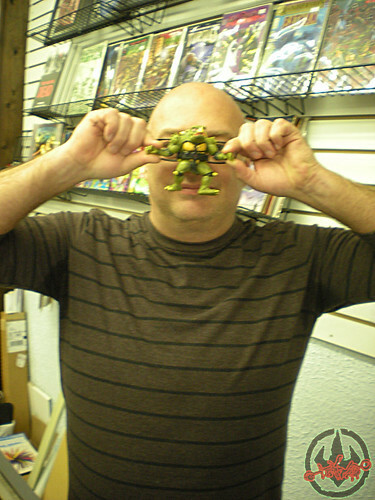 Infamously, Dr.Quease – Dragon Lord’s mad scientist, the fourth villain in the wave would not see release. 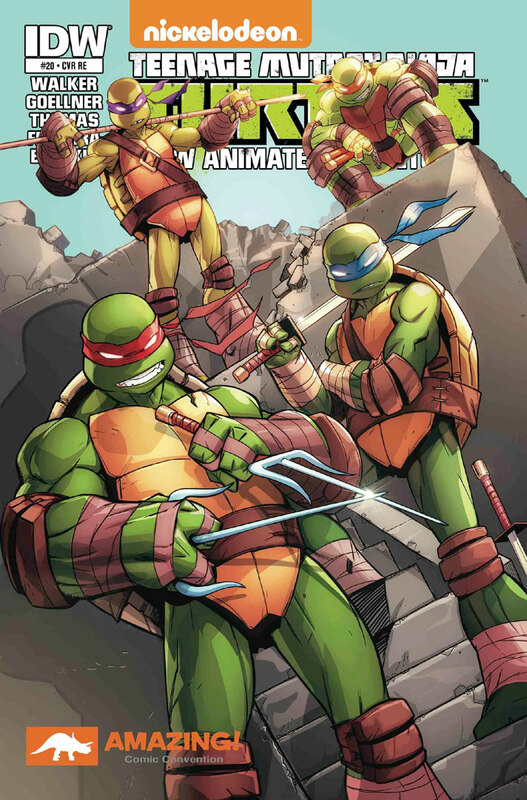 All this was happening as the Next Mutation’s first and only season was going into hiatus. 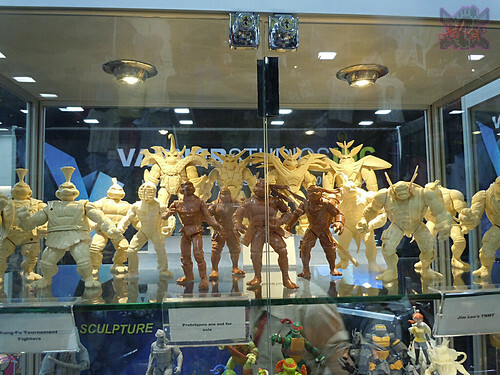 The remaining months leading to K•B closing out the line of toys seemingly exclusively with the Deluxe TURTLEFLAGE Dragon Lord and Teens, the basic Next Mutation figs, and the popular classic TMNT reissues showing up in the big grated discount bins in front of K•B’s old mall stores. Important note on this page:: You get a fleeting shot of Dr.Quease here with the basic Camo Teens and bad guys with a faint peek as to what his weapon would have looked like. We also have painted prototypes on the display stands that the young lady is holding at the Playmates booth, the SHADOW NINJAS!! 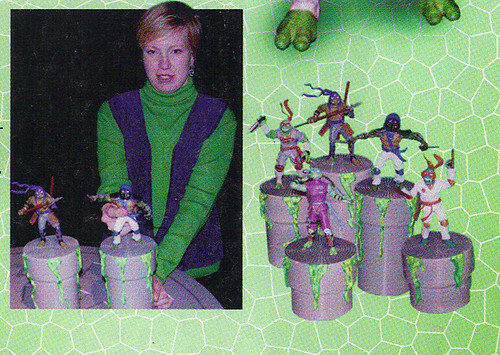 These most impressive figures would into hiding, never to be released. They were due possibly upon the arrival of a hypothetical second season of NEXT MUTATION. That was not meant to be so Varner’s incredible, heavily martial arts themed Teens went back to California and into the Varner vaults seemingly forever. With the exception of Raph, we are given a blurry view of Venus and the rest of the team. I recall publication of more images of the Shadow Ninjas elsewhere ( maybe an older Playmates Catalog ) but that may be just wishful thinking in this ol’ Snapper’s untrustworthy brain. 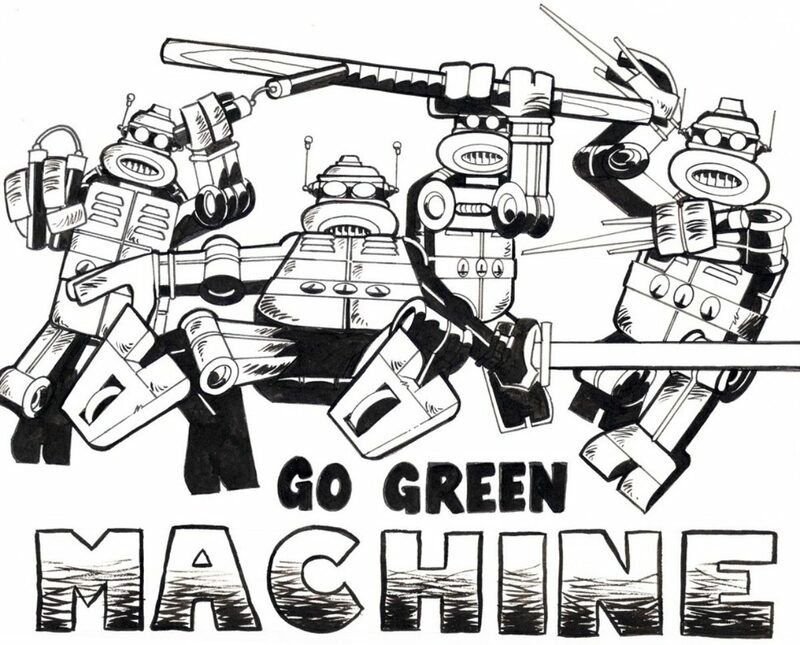 This page was, for me – the only verification that these toys existed. 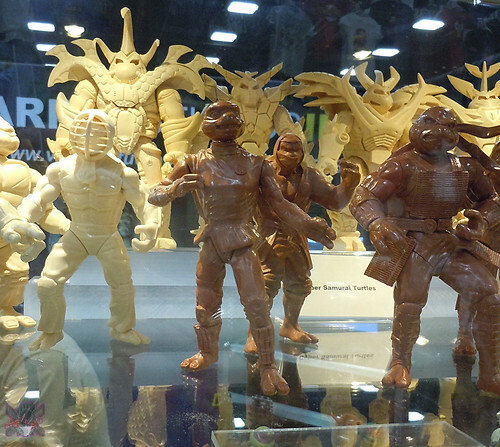 16 years later at SDCC 2014, at the VARNER STUDIOS booth – the unpainted prototypes from Steve and his team themselves had put the Shadow Ninjas out on display for the public to see in time for the Teens 30th birthday. 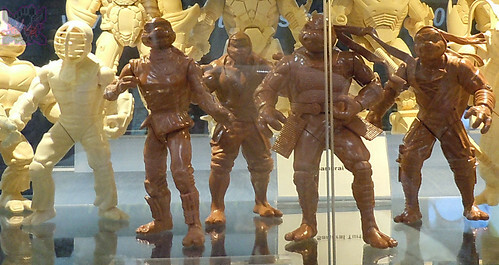 A pretty good shot and rare image of the unproduced – painted “SHADOW NINJA” Raphael proto. I brought these images up to hi-rez best i could, but it didn’t do much good. Well a little bit. Whatever- you get a better grasp at the color scheme of the Teens in their awesome SHADOW NINJA martial arts gear. Varner Studios can make ANY Turtle look really cool. Again i attempted to enlarge a portion of the photos in the article. 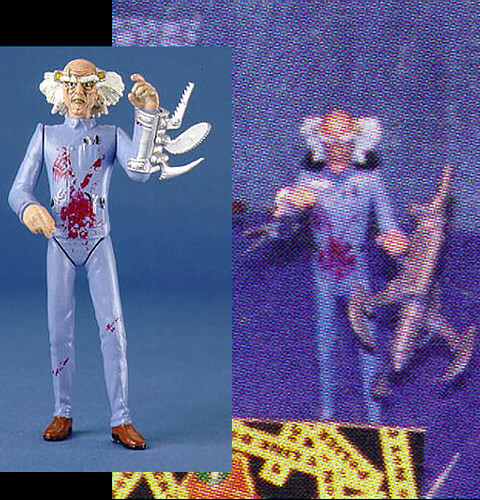 Dr.Quease looks like he may be holding some kind of pincher-like projectile launcher or something. 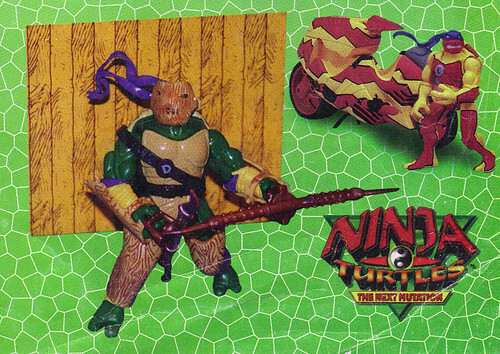 His scalpel-like arm weapon appears to have been a clip-on as it appears on the opposite arm of the prototype pictured from the back of the TURTLEFLAGE packages. The blood-splatter design on his jacket appears a little different than on the package image as well. But it is hard to tell as the article image is a bit blurry even when enlarged. Still you get some good ideas as what could have been if he was released to retail. Finally in the breakdown of the page, here’s a small shot of the cool TURTLEFLAGE LEO and his CAMO BLITZ CYCLE, a really neat bike. 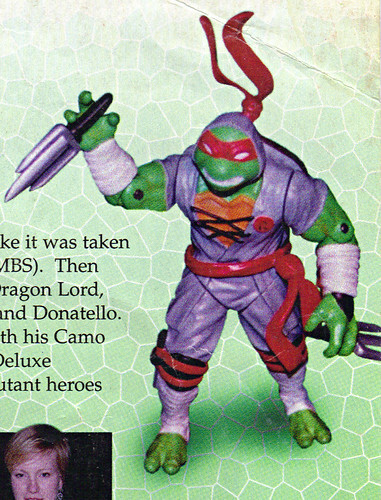 I beleive that toy is actually rather sought after nowadays along with the DLX Donatello vehicle from the same series. A good shot of the creepy-cool basic TURTLEFLAGE DON appears too – the article mentions his camo mask lookin’ like it’s from SILENCE OF THE LAMBS .. EEEEEeessh !! ERNIE REYES Jr. RETURNS to NCIS: Los Angeles, MONDAY ! !